Huh. 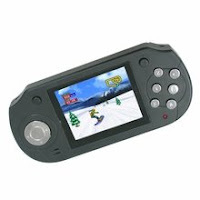 Kotaku reports on this new handheld device, which plays Genesis and Mega Drive cartridges -- ! Wow, didn't see that coming. You can buy it for yourself next month. Looks like a pretty sweet little device, assuming it is of decent quality. Can't really tell how nice the screen is from the catalog shot provided. Pretty neat that it plays US and foreign games! And only $50...a retro gamer could find worse ways to spend the cash. Too bad I'm not a bigger Genesis fan. I'll bet this could sell in the UK. Anyone interested?